Frame S’ moves relative to frame S at o.620c in the directions of  increasing x. In frame S’ a particle is measured to have a velocity of 0.470c in the directions of increasing x’ . 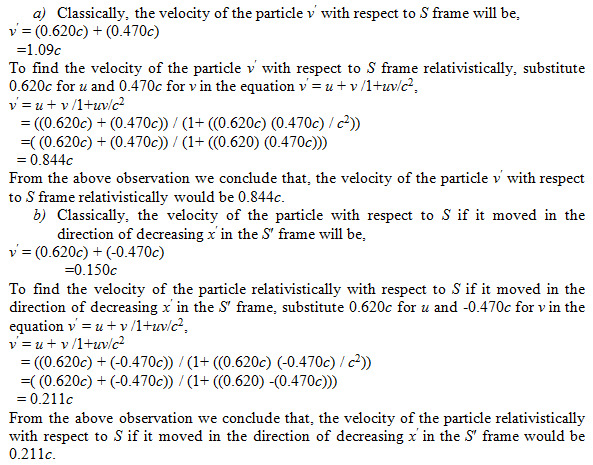 (a) What is the velocity of the particle with respect to frame S? (b) What would be the velocity of the particle with respect to S if it moved (at 0.470c) in the directions of decreasing X’ in the S’ frame? In each case, compare yours answers with the predictions of the classical velocity transformation equation.